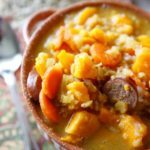 This Hearty Split Pea Sausage & Sweet Potato Soup is sure to warm your belly with wholesome goodness! In a slow cooker, add your onions, carrots, celery, garlic, sweet potatoes, and split peas. Cover with broth. Add your spices. Cook on high 4-6 hours until sweet potatoes are tender & soup reaches a thick consistency. If needed, cook an additional hour.